I grew up on the East Coast, but it turns out that I’m a desert rat at heart. Until I moved to Vegas at the end of 2011, I’d always lived in fairly temperate places: Upstate New York, Rhode Island, northern Japan, Colorado, and Kentucky. There is something to be said for the rolling green hills back East, but I immediately fell in love with the sharper desert landscape. Without all that greenery covering everything, you can really appreciate the geology of the Southwest. The harshness of the Mojave Desert has also made me appreciate the incredible toughness and adaptability of the plants and animals here. The beauty of the desert is undeniable. One of the first things I did after getting settled in Vegas was to take my dogs hiking at Red Rock Canyon. I had done some hiking previously, but Red Rock was where my love of hiking blossomed. I quickly learned that plants here are very pointy and probably shouldn’t be touched, and that getting on the trail by sunrise affords the most astonishingly beautiful views of the mountains around Red Rock. 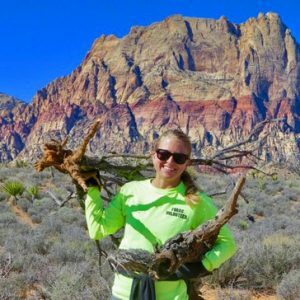 It wasn’t until several years later that I began volunteering with Friends of Red Rock Canyon (FORRC), and it snowballed from there. I’ve always had a passion for giving back, but no organization that I’ve worked with makes it as easy and fun as does FORRC. I’m on several of the dedicated volunteer teams, including Light Trail Maintenance, the Native Plant Team, Natural Resources, and of course, the Tortoise Team. I fell in love with Red Rock Canyon’s rescued Mojave Desert Tortoises as soon as I met them. I never would have guessed that tortoises could have such individual personalities, but I soon learned how wrong I was. Meet each one of them. I love and respect all animals, and it’s been an amazing opportunity to work so closely with a threatened species. Educating visitors about the Mojave Desert Tortoise has been a very important part of my time as a volunteer. I want to help protect them for their own sakes – and for future generations of people to appreciate as well. To that end, I’ll be attending a two-day course with the Desert Tortoise Council in November. I hope to learn even more about tortoises so that I can make our little (or in Hugo’s case, not so little) friends’ lives as enriching as possible. I also aim to give our extremely dedicated volunteers, as well as visitors to the tortoise habitat, a rewarding and fun experience. I often think about how much richer my life has become thanks to the Mojave Desert, FORRC, and the tortoises. I couldn’t ask for more!